A mother bear and two cubs feed at a man’s property near Animas View Drive. The man was ticketed for the third time in eight years for intentionally feeding bears. A Durango man has been ticketed for intentionally feeding bears – for the third time in eight years – resulting in a $1,000 fine and a likelihood the bears will have to be euthanized. 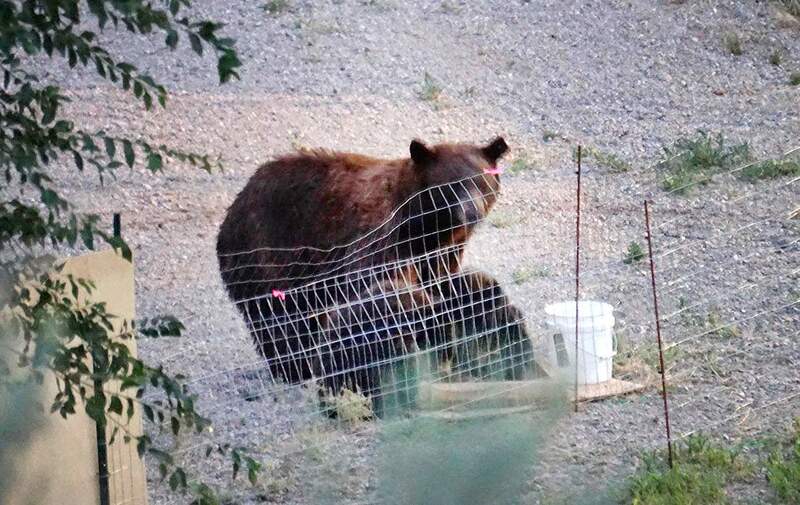 Last week, a concerned resident told Colorado Parks and Wildlife that a person living in the Animas View Drive area, in northern Durango, was scattering pet and animal food in his backyard and using containers to feed bears. The resident took pictures and provided them to Colorado Parks and Wildlife, Thorpe said. After further investigation, it turns out the man who was feeding bears had been ticketed for the same behavior in 2010 and again in 2012 when he was living in another residence farther north of town. In Colorado, it’s illegal to knowingly feed bears, and fines escalate with each violation. The first offense carries a $100 fine, and a second violation holds a $500 fine. When the man was contacted Sunday by Colorado Parks and Wildlife officers, he was issued the maximum penalty of a $1,000 ticket. With associated surcharges, the fine will come out to about $1,400, Thorpe said. Thorpe said the man, when contacted, wrote a check and paid the fine on the spot. If he is caught feeding bears again, it would carry another $1,000 fine. It’s rare that a resident is ticketed for knowingly feeding bears, Thorpe said. Usually, when people are made aware they are attracting wildlife, such as leaving out bird feeders or unsecured trash, wildlife officers issue a warning and residents fix the issue or correct their behavior. In this case, the man was well aware his behavior was illegal and bad for the animals, but he continued to do it, Thorpe said. Feeding bears is bad for both the animal and surrounding neighbors. Bears that become habituated to human sources of food often return, expecting an easy food source. As a consequence, the animals lose their natural fear of humans and become more brazen in their actions. When bears continually display this sort of behavior, wildlife officers have no other choice than to euthanize the bears. Thorpe said a picture the resident took shows a mother bear and her two cubs taking advantage of the man’s food, but it’s unclear if other bears were also feeding off it. The bears’ fates have not yet been determined. Thorpe said wildlife officers will be on high alert in the area, monitoring both bear behavior and also the man’s property in case he starts feeding the animals again. In a worst-case scenario about 10 years ago, a 74-year-old Ouray woman who had a long history of feeding bears and ignoring warnings not to feed the animals was attacked and killed by the bears she was providing food. A number of bears believed to have killed the woman were euthanized. In 2015, a Colorado Springs woman was arrested after being warned for more than a year to stop luring bears onto her property. At least one of the five bears she was feeding was euthanized, according to The (Colorado Springs) Gazette. And earlier this month, a man in Cloudcroft, New Mexico, was attacked by one of the four bears he had been feeding routinely. As a result, wildlife officers there had to euthanize all four bears, the Ruidoso News reported. Colorado Parks and Wildlife declined to identify the man ticketed. The Durango Herald has filed an open records request seeking more information, including the man’s identity. A Durango resident was fined $1,000 for intentionally feeding bears. Was the fine too high, just right or too low?